Creating Keepsakes has two great new special issues that just became available. 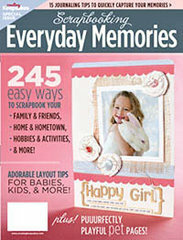 The first is called Scrapbooking Everyday Memories. In the editor's note, Jennafer Martin states, "Far from ordinary, everyday memories from thing like routines and hobbies often make up some of the best in our lives - and some of the best in our scrapbook pages in our albums. Ironically, those everyday memories are often overlooked in our scrapbooks." I couldn't agree with the first sentence more and sadly, I'm sure that her second statement holds true for many scrapbookers as well. This issue is dedicated to inspiring all of us to scrap these types of memories now. This issue is JAM-PACKED with 147 project samples and throughout the issue, you'll also find numerous tips related to design, photography, journaling, and supplies. There are also numerous sketches accompanying the samples in the book. 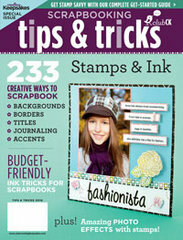 The next special issue is Scrapbooking Tips & Tricks: Stamps and Ink. "Whether you're new to stamping on your scrapbook pages, or you've been collecting stamps for years, you'll be sure to find great ideas and inspiration in this new special issue. Learn the basics of stamping, find fabulous techniques to jazz up your layouts, and be inspired to use stamps for titles, journaling, borders, backgrounds and more! You'll also discover the latest products, as well as time- and money-saving tricks." This special issue is structured more as a regular magazine issue rather than as an idea book divided into chapters or sections. However, it is still full of ideas related to stamps and ink. Personally, my personal favorite of the two is certainly Scrapbooking Everyday Memories. I discovered many topics in Scrapbooking Everyday Memories that I have not thought of before and believe that I will be referring to this issue many times in the near future as I plan my photos and create new layouts. However, it's not a lack of valuable content in Stamps & Ink that I didn't choose it as my favorite. It's simply because I've simply never been much of a stamper. I do use them, but rarely..it's just a personal preference thing. Regardless, I can see that there are many intriguing and imaginative techniques shared in this issue. Lucky for all of you, I have one free copy of each of these great special issues to give away! To enter, all you have to do is answer the following question in a comment to this post by 5:00 p.m. on Thursday, ?? and you'll be entered for your chance. Which of these two CK special issues would you prefer and why? Random.org will choose and I will announce the winners on Friday. If you just can't wait, or if there are other titles you have been eying, Creating Keepsakes has been generous enough to offer a 15% off coupon code which is good on anything in their store through December 20, 2010. Just enter the code CKDT15 at checkout. SHOP NOW!